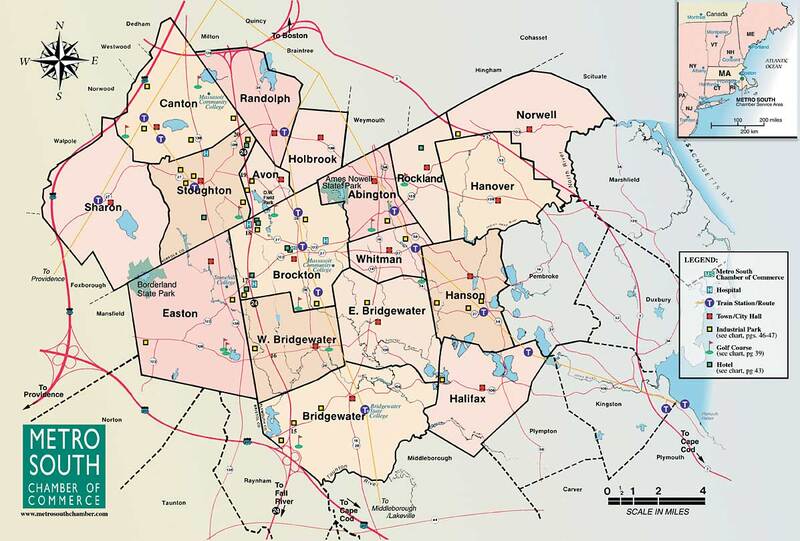 The Metro South region consists of eighteen communities south of Boston, and is centered in Brockton, a city of 100,000 people. 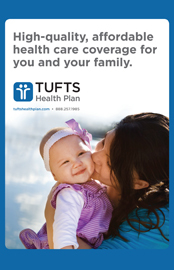 It is one of the fastest growing regions in Massachusetts with 10,000 new arrivals since 1959. Metro South is a major market with more than 340,000 people. 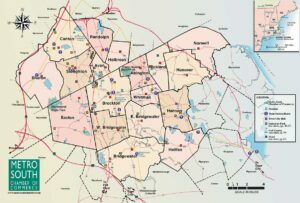 Over six million people live within a fifty-mile radius, while half the population of Massachusetts is within thirty minutes of the region. The diverse economies of the area prosper from manufacturing, retail, wholesale trade and service industries. Employment opportunities are plentiful and several business resources are available for entrepreneurs. The region has a proud history: Thomas Edison partnered with community leaders and the City of Brockton to allow Brockton to become an experimental laboratory producing a number of innovations. He supervised construction of the first power station in Brockton and he threw the switch that gave Brockton the world’s first three-wire underground electric transmission system. This model was replicated in over five hundred cities nation wide. The city also became one of the first in the world to use incandescent and arc lamps for street lighting and one of the first with an electric trolley line with electric lights. The region was also home to the first industrial park, the first assembly-line operation, the first tack cutting machine, the first electrically operated fire station and the first theatre in the world to be electrically lighted, which was the envy of the entertainment world at the time. The baseball glove and the toll house cookie were also invented in the region and the nation’s first department store Santa Claus appeared in a Brockton department store in 1890. The Metro South offers the best of many worlds, all of the cultural and corporate advantages of the city with the natural beauty and serenity of historic New England. Residents and visitors can always find an array of recreational, cultural and community events throughout the region. The Metro South region is particularly proud of its innovative community-based schools. Many new public and private schools provide exceptional technology and preparation for the children of the region. Higher education is attainable within the region at Bridgewater State College, Massasoit Community College, and Stonehill College. Harvard, MIT, Brown, UMass Boston, and many prestigious universities are within minutes of Metro South. For more information on the workforce and higher education visit Tools for Hiring, Training, and Retaining. Housing costs are extremely competitive in Metro South. Prices are substantially lower than in the immediate suburbs of Boston. The region offers many housing options including modern condominiums and apartments. For housing information visit the Real Estate page. The Metro South region offers a number of fine health care facilities including four major hospitals. Brockton Hospital, Caritas Good Samaritan Medical Center, New England Sinai Hospital and Rehabilitation Center, and the Department of Veteran Affairs Medical Center provide state-of-the-art medical care to area residents. Combined, these healthcare facilities represent the regions largest segment of employment. The Metro South region is 20 miles from the Boston Seaport, 30 miles from the Fall River seaport, 40 miles from the New Bedford seaport and 60 miles from Gloucester. Numerous media outlets are available in the region. The daily newspaper, The Enterprise, boasts a circulation of over 62,000, serves 31 communities in the area, and includes a Sunday edition. Several weekly community newspapers provide additional coverage of local affairs and events. The area’s local radio stations include WBET (1460 AM) and local college stations. All major television network programming is clearly received from Boston and Providence, as well as educational programs from Boston’s Public Broadcasting Station. All eighteen communities provide cable service to residents. Metro South is close enough to Boston to enjoy its theater, symphony, sports arenas, and museums, but far enough away to have developed its own dynamic cultural and recreational resources. The region takes pride in the Fuller Museum of Art, Brockton Symphony Orchestra, Brockton Shoe Museum, Brockton Fire Museum, The Children’s Museum in Easton, Ames Nowell and Borderland State Parks, and D.W Field Park. The area has several public golf courses, tennis clubs, racquetball courts and fitness centers. Metro South is less than one hour from Boston, Providence, Plymouth and Cape Cod where additional day trips may be enjoyed. For a complete listing of cultural and recreational attractions available in the Metro South visit Visitor and Travel Information please view our Book for Business.